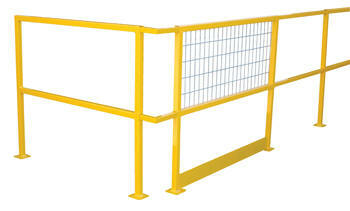 An economical way to protect people and machinery. Applications include loading docks, floor openings, walkways, and mezzanines. 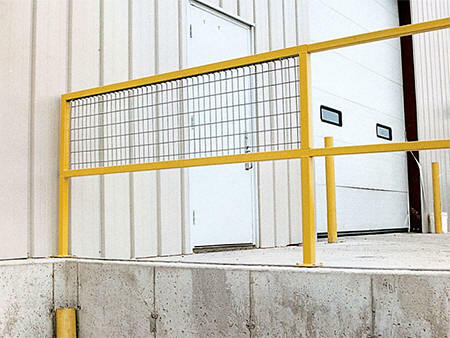 Highly visible safety yellow powder coat finish. Available with or without toeboards as application requires. CSEC-48 1-1/4" -- -- 47-7/8" 14/pr. CSEC-60 1-1/4" -- -- 59-7/8" 15/pr. CSEC-72 1-1/4" -- -- 71-7/8" 18/pr. CSEC-84 1-1/4" -- -- 83-7/8" 20/pr. CSEC-96 1-1/4" -- -- 95-7/8" 32/pr. CSEC-108 1-1/4" -- -- 107-7/8" 40/ea. CSEC-120 1-1/4" -- -- 119-7/8" 43/ea.